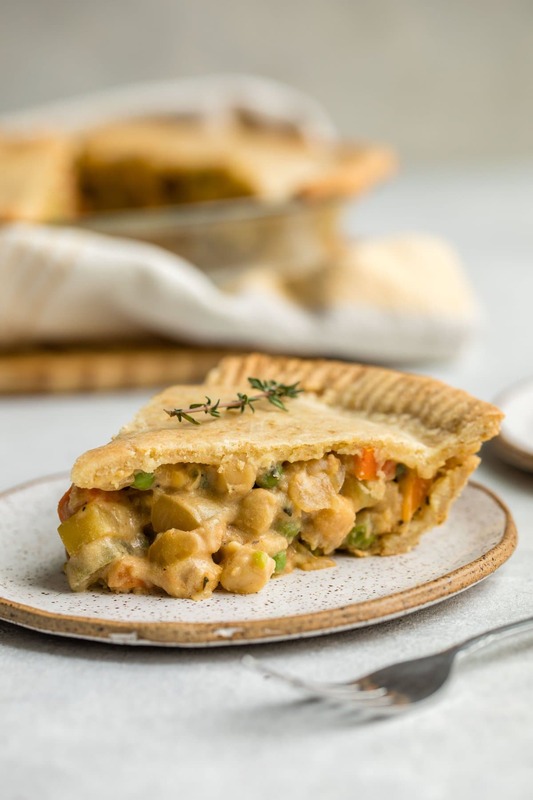 Hearty and Cozy, this Chickpea Pot Pie has a flaky crust, lots of veggies, a creamy sauce, and plenty of plant-based protein thanks to hearty-healthy Chickpeas! 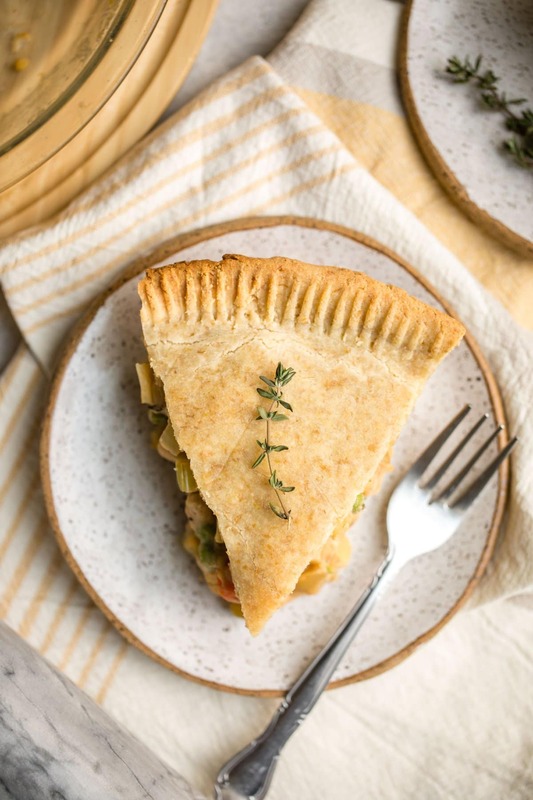 Is it just me, or is Pot Pie pretty much the ultimate comfort food? I mean, it’s pretty hard to beat a buttery crust combined with a creamy, hearty, and flavorful filling. It’s a perfect cozy day food to snuggle up with – but equally as appropriate to make when you want to feed your soul or give your taste buds a little extra love. 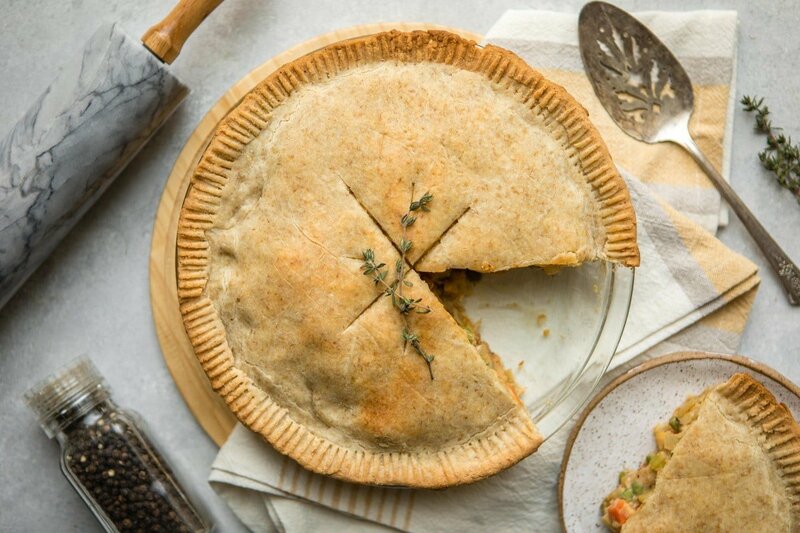 Most Pot Pie is typically, well, not Vegan. But us plant-based peeps deserve to enjoy this mouth-watering comfort food too, am I right?! I know I’m right. That’s why I decided to make this Chickpea Pot Pie! With a few simple substitutions — like heart-healthy Chickpeas for Chicken — this recipe is equally delicious as the classic. Plus, it’s also Gluten Free, Grain Free, and even Oil Free! Dare I even call it “healthy”? 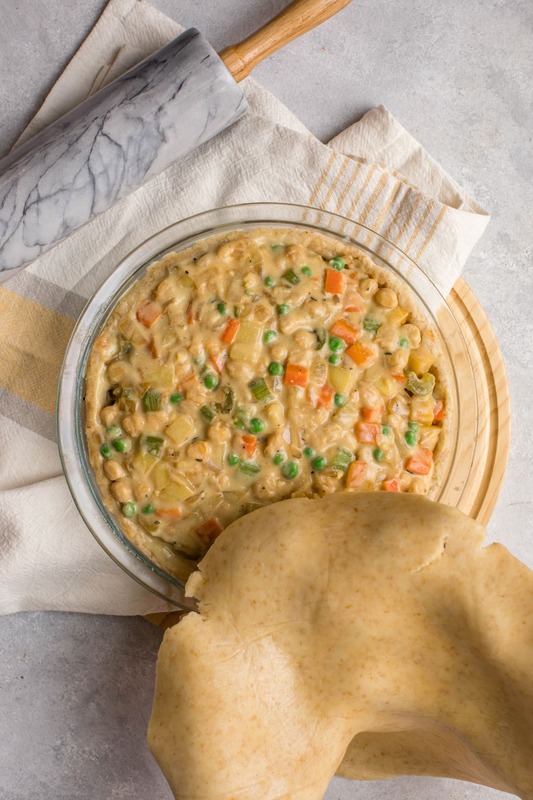 We’ll start by making a thick and creamy “Sauce” for our Pot Pie with some Non-Dairy Milk, Nutritional Yeast, and Chickpea Flour. This will replace the Heavy Cream or Canned Soup that’s in the “normal” recipe. Then we’ll sauté our veggies in some spices – I kept things pretty classic here with some Celery, Peas, Carrots, and Gold Potatoes for a nice and hearty bite. Toss these with the Chickpeas and Sauce, then place in a Pie Crust and bake away! I opted to use my 3 Ingredient Pie Crust for this recipe, but you can use another recipe if you’d like. Fair Warning: your house is going to smell abso-freakin-lutely amazing while this bakes in the oven. 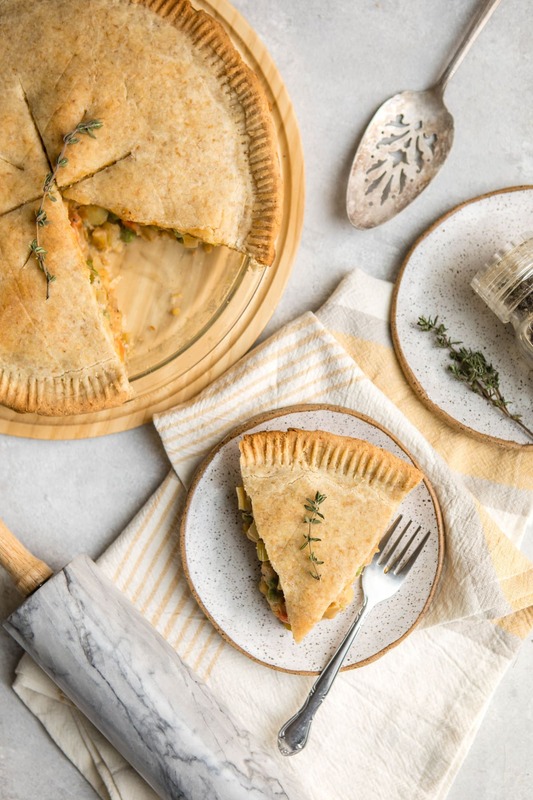 And you’re most likely going to do a happy dance when you take your first bite 😉 I would recommend preparing this Chickpea Pot Pie when you have friends and family over, because it’s so dang good and you may not be able to hold yourself back from eating it all at once. I’m so happy with how this Chickpea Pot Pie turned out! It’s just as yummy and cozy as the ones I remember eating in my childhood, and I can’t wait for you guys to try it yourselves. Isn’t it amazing how we can recreate prettty much anything with plant-based alternatives? Let’s serve ourselves a warm, thick, and healthy slice of pie and celebrate. I used a combination of Fresh Carrots + Frozen Peas for my vegetable filling, but you can also make things easier on yourself and buy a frozen blend of the two. This recipe has a longer ingredient list, but the steps are still very simple! However, both the Pie Crust and Chickpea filling can be prepared in advance if you’re looking to save time later. If you’re looking for more Cozy Vegan recipes, you’ll also love this One Pot Vegan Mushroom Stroganoff, this Easy Vegan Chili, and this Sweet Potato & Rosemary Vegan Quiche! 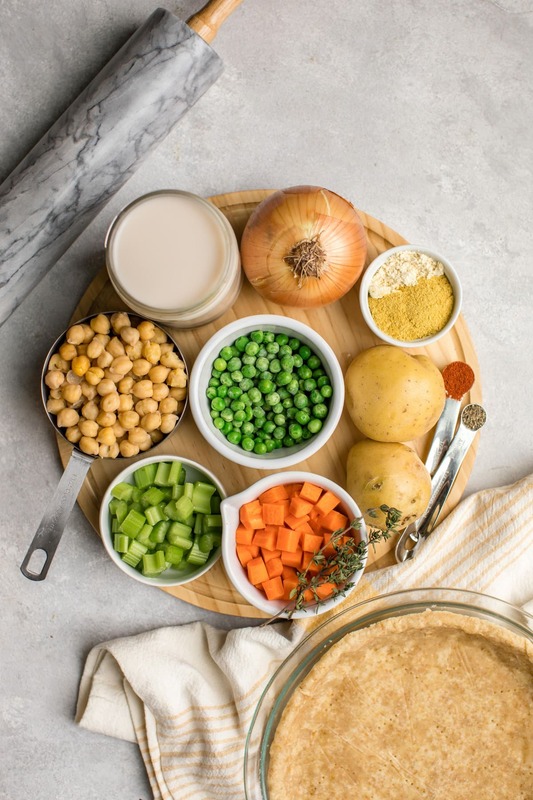 Hearty and Cozy, this Chickpea Pot Pie has a flaky crust, lots of veggies, a creamy sauce, and plenty of plant-based protein thanks to Chickpeas! Prepare the “Sauce”: Combine all ingredients in a small pot and whisk to combine. Bring the mixture to a boil over high heat, then reduce the heat to medium and simmer for 5 minutes, whisking occasionally. Set the sauce aside while you prep the filling; it will thicken slightly. Cook the Filling: While you prep the filling, preheat the oven to 425F. Add a splash or water or oil to a large Nonstick pot over medium heat. Sauté the Onion, Celery, and Carrot until translucent, then add the spices and cook for an additional 1-2 minutes. Add the Potatoes to the pot along with ¼ cup of water, then cover and let steam for 5 minutes. Uncover, then stir in the Chickpeas, Peas, and thickened Sauce until well-combined. 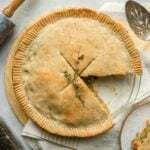 Assemble the Pie: Pour the Chickpea & Veggie filling into a 9″ pie tin “lined” with a pre-baked Pie Crust, then cover with the additional unbaked pie crust. Use a fork or your fingers to “pinch” the top crust layer with the bottom layer, then cover the edges of the Pie Crust with tin foil (see notes). Bake at 425F for 15 minutes, then remove the foil and cook for an additional 10-12 minutes. You can keep the top layer of the Pie Crust unbaked for this recipe, but I suggest pre-baking the bottom one at 400F for 15 minutes. Chickpea Flour can be replaced with Brown Rice Flour or All-Purpose Flour; I have not tested any other substitutions. I find that the easiest way to cover the pie crust edges with tin foil is to cover the entire pie with one sheet and then rip or cut a hole out of the center of it, so the center of the pie is still visible. Wow, this looks amazing! I’m so inspired to make this, thanks Caitlin! Wow, what a delicious-looking pie! I am astounded that the crust is just made from chickpea flour–I never realized how versatile and how well it holds together on the surface! The filling looks so phenomenal that I could eat it on its own too. Might have to test this out, but I wonder if whole wheat flour would work for the crust if you needed to substitute! My husband and I are trying to eat more vegan-inspired food. 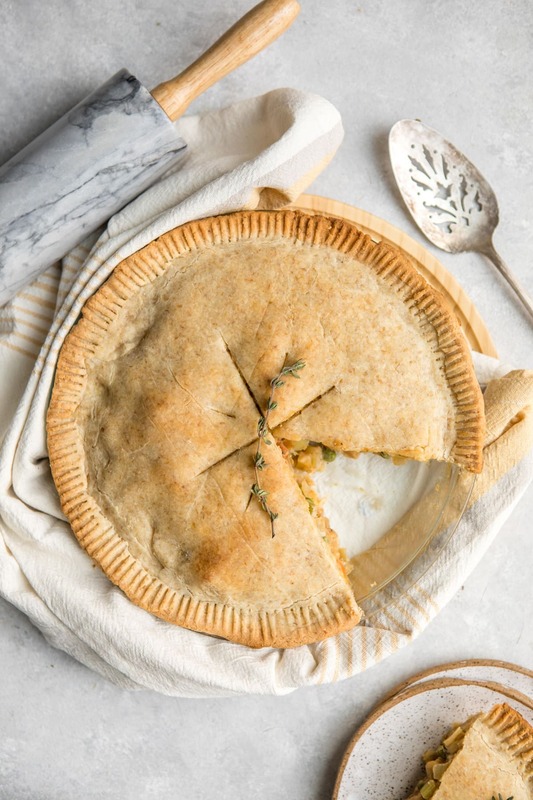 This pot pie and the associated pie crust are fantastic! 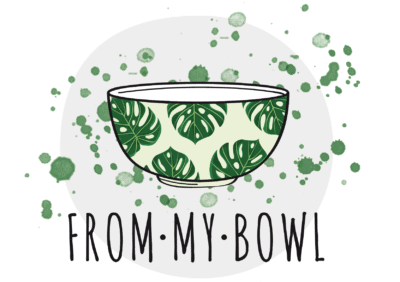 Thank you for sharing these recipes! This looks amazing, and like I can’t screw it up! Should you freeze the second pie crust that you don’t pre-bake first? No, no need to freeze! You say to used cooked chickpeas. How do you cook them? I was going to make this tonight but just realized that I got too much chickpea flour and not enough almond flour for the crust. I know you haven’t tested the crust against any other flours but based on your infinite vegan wisdom (lol, I know nothing) do you think chickpea flour could work?I only got enough almond flour for one crust. Just finished this! I stayed up late just to finish. It tastes AMAZING!!!!! I was worried I didn’t get enough almond flour for the crust but I made it stretch. It tastes just like a normal pot pie and I have just found my new favorite “cheat” meal!! Thanks for the awesome recipe! You’re so welcome 🙂 enjoy! Just made this recipe and it was fantastic! I am vegan, but my family is not and they enjoyed it too! Last night I made your baked mac n cheese and that was also really great! Everytime I make something from your blog I am so pleased! Caitlyn, You’re fantastic! Thank you! Tomorrow night I am making your curried lentil soup and I am so excited! This was the BEST vegan pot pie I have ever made! Taste just like what my mom makes! This will definitely be a winter staple for me. I don’t love cooking with foil is it ok to skip it here? The crust will probably burn without it! My girlfriend and I were talking the other day about how she used to love chicken pot pie as a kid and then I saw your YouTube video making this. So I surprised her and made it and its AMAZING. I was never a pot pie fan but this is delicious. Instead of the cup and a half of chickpeas I used 2/3 cup and then 2/3 cup of navy beans. I also added fresh garlic and broccoli to the filling. Also for the sauce I seasoned it with black pepper and a dash of seasoning salt just cuz I like to layer flavors. Anyway thank you for this recipe this is definitely a keeper!! Hi! Very excited to make this pie this week. Grew up on chicken pot pies but haven’t had anything like it since going vegan! Do you know if leftovers would keep in the freezer? Looks great! Do you think this might freeze unbaked? I have just made this today – the mini pie version. I ran out of almond flour and sub it with 1/2 cup of Bob’s Mill Gluten free flour. Turns out well!! It is so yummy…. Do you think this would work if I made it tonight for dinner tomorrow night? You could just make the filling, yes! I am making this pie for a party but I only have time to make this the day before the party. Am I able to just make the whole pie in advance, let it cool, refrigerate it till the next day and then reheat it? If so, how long and what temp should I reheat this at? Thank you!!! Hi Caitlin! Thank you so much for sharing this recipe! It was delicious! I think next time I am going to sub chickpeas out for lentils because they are a bit more savory, and I didn’t quite get my crust right, but I’ll keep trying! This was my first time ever making a pie, and I think it turned out pretty well! That’s great to hear Brittany! AMAZING!!!! I made this the other night and it was PERFECT! Before I transitioned to a plant-based diet I was a pot pie junkie lol. My boyfriend is an omnivore but loves the vegan alternatives I try out on him. Bottom line we both loved this dish and ate it all within 24 hours 🤣. I did no modifications except I used a frozen pie crust. Thanks so much for this!! Will be trying another recipe if yours tonight! That’s awesome to hear, Sarah! This was soooo good! I added half a block of tempeh and it was a GREAT add in! Just wanted to leave a message to anyone, like myself, with celiac. there are no frozen vegetables that I know of that are completely gluten free. So be careful – use fresh vegetables to be safe. Interesting – thank you for the tip, Michelle!